See, put your money in stocks, close your eyes and you’ll be fine in a couple decades. Who has a twenty year time horizon? How many people have the patience to wait that long? There is some truth in each of these statements, but as with most things the historical data is never black or white, but a shade of gray. The future is uncertain, so investors should always think in terms of probabilities, never guarantees. What this data tells me is that the longer your time horizon, the higher your probability of seeing a gain in the stock market. Does this mean that you’re guaranteed to earn a certain level of returns in stocks if you hold them for a specfied time frame? No. Will these same results be guaranteed to repeat themselves in the future? No. Are there investors out there who actually have twenty year time horizons? Absolutely — Millennials just starting out in their career, middle-aged workers playing catch-up with their retirement savings and even retirees who will likely have 2-3 more decades to invest during their retirement years. The difference in each case comes down to how much each of these investors should hold in stocks and what their needs are in the meantime. I like to think that every single retirement contribution has it’s own twenty or thirty year time horizon. The standard deviation of annual returns over 20 and 30 year time frames has been remarkably low — just 1.3% and 2.8%, respectively. The volatility in returns has historically fallen off a cliff as you extend the time horizon in the market. 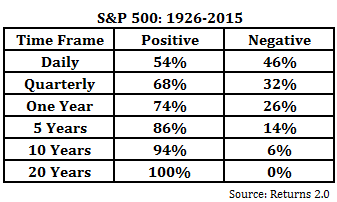 Volatility in the stock market during the 1930s was insane. Not only did the market drop more than 80% during the Great Depression, but during that period there were two separate quarters that saw stocks rise in excess of 80%. In contrast to the large losses seen in 1930s, the bull market of the 1980s and 1990s produced an amazing run of gains for long-term investors. If you would have invested at any point between 1973 and 1985 you would have earned anywhere from 12-18% per year over the following twenty years. Nice post, thanks Ben. One of the remarkable things from reviewing the historical data is that variance of equities is lower than that of bonds (and incredibly low as you pointed out) when the time horizon is expanded (remembering a chart from Jeremy Siegel’s book) due to the mean reverting nature of equities. The hard part I would think is knowing how to reallocate as one moves closer to retirement/withdrawals. Yup, one of the crazier stats out there. I agree that things become much more challenging as you approach retirement age. 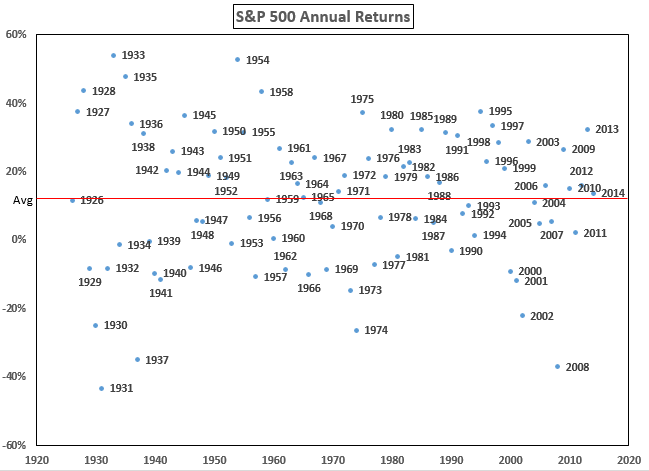 I am calculating a standard deviation of 17.6% for annual returns of SP500TR since 1988. The mean annualized standard deviation (rolling) is 7.32% with a standard deviation of 7.32%. I agree, stock market SD’s seem to be 15%+ … a 60/40 portfolio about 12-13%… can’t get much below 5% even in cash. I think those are all annual measures though. It sounds like those low SD numbers are the result of taking a sequence of 20 (& 30) year average equity returns? Meaning, data point 1 is 1930-1950 return, data point 2 is 1931-1951 return, etc…. I expect that would produce a result on the order of these lower numbers that Ben notes above. I think you are correct. He is actually talking about the stdev the average return over 20 or 30 years. Still this is of no cancellation to investors in 2003 and 2008 that faced a 50% drawdown and possibly sold everything and ran for cover. Ensemble averages can be quite misleading. It is rather time averages that reflect the risks in the markets. No consolation indeed, but had they fully understood the implications of this chart, perhaps those who sold in panic might have held on? Emotions are a tricky business. Investing is as much or more about temperament & perspective than it is about IQ (aren’t most things?). 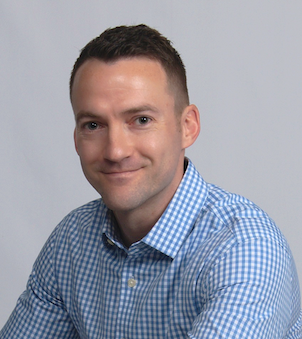 “Anger, fear, aggression, the Dark Side of Investing are they… consume you it will…” ;>). Of course, no stats matter if you sell after a crash. Fantastic graphs on S&P time frame and S&P returns. Thanks so much. 46years of + returns vs 42 of negative ones but most positives being higher 41 of these +ves giving a return between 0 and 40%, as opposed to 36 giving a negative return between 0 and “just” -20%. Still a compelling case! Just wondering. Since 2015 isn’t over yet. Is there an “as of” date for the data? I didn’t see one. 1.) There are 69 (technically 68, as 2015 is still not over) data points for the “20 years” time frame. That is hardly statistical significant. 2.) The data is most likely not adjusted for inflation, is it? If we adjust for inflation, there will be “20 years” time frames with negative performance. Moreover if we look for instance at the “INFASPG Index” (S%P 500 in Gold Index), there are plenty of negative “20 years” time frames as well. 3.) This statistic is “S&P 500” specific (or let’s say Western “market” specific).. Take for instance a look at the Nikkei 225, There are various “20 years” time frames with negative performance. The stats are essentially taking a 90 year US boom period (and tailwind of WW2 technology), and then tried to extrapolate it another 30 years. If I gave you a 3 day uptrend and told you tomorrow must be going up too, would that be sound advice? It’s not your fault though, because we simply do not have 2000 years of data, much less for other markets for 2000 years (eg. commodity markets, European/Asian fixed income and equity markets). Taking US economic data of the last 90 years and extrapolating it forward 30 years, is a bit akin to extrapolating China economic data for the last 30 years, and extrapolating it forward for the next 10. Or taking the last 30 minutes of NIKEI data and extrapolating the line 10 minutes. It’s not ridiculous, but I wouldn’t bet on it, much less invest on it.